When you’re sat at home on a hot day being cooled by your air conditioning unit, we bet you don’t give much thought to the invention of it. Who invented AC? When? Where? And how? Now you’re curious, let’s look at the history of AC and how it has developed throughout time. The scientific principles behind air conditioning were researched by Benjamin Franklin in the 18th century, and then by Michael Faraday the following century. However, the mechanical air conditioner didn’t come to be until the early 20th century, when an American man called Willis Carrier invented it in 1902. His intention was not to keep people cool, though, but to prevent humidity from causing paper to crease and inks to run at a printing plant in Brooklyn where he was employed as an engineer. Not long after this, a similar device was employed by engineer Stuart Cramer in a textile plant, again to improve the quality of the air. This is where the term “air conditioning” is typically traced back to, even though Carrier was the first to formally employ the technology. At this time, air conditioning units were a luxury afforded only by rich individuals and large companies. It was first installed in a private home, a millionaire’s mansion, in 1914, and then movie theatres began relying on it from the 1920s to keep their patrons comfortable. AC didn’t start to become widespread in American homes until the 1950s. AC usage grew rapidly over time, from 10% of US homes in 1965 to almost 90% today. Air conditioning has obviously come a long way since this time. For starters, it has become a lot safer. A lot of units back then used ammonia as a coolant, which released harmful gases into the air as it cooled. The technology used in air conditioners has also developed a great deal over time, and continues to develop today. AC units were made smaller over the years and worked more efficiently as new technologies were introduced, such as rotary compressors and semiconductors. Today, the latest addition to AC is smart technology. So, you now have the option of turning your AC on or off, or adjusting the temperature, from wherever you are using your smartphone. There are AC units with motion sensors that activate whenever someone is present in the room. The possibilities are endless! What developments can we expect in the future of air conditioning? We’ll have to wait and see. 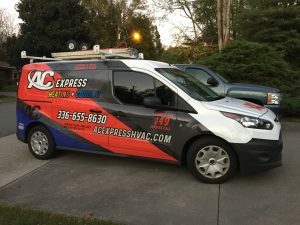 In the meantime, you can contact AC Express for all your AC needs in Winston Salem, Clemmons, Lewisville, Advance, and surrounding communities in the Piedmont Triad.